Written by chris maroulakos on Friday, September 30th, 2016 at 9:00am. Most musicians would be thrilled to write even one song with an unforgettable melody and poignant lyrics that burrow into the listener’s heart as deeply as their ears. Tegan and Sara have written hundreds. The Canadian duo unspooled many of those pop gems during last weekend’s Observatory North Park show. Everything from a danced-up version of their 2004 hit “Walking With the Ghost” to “That Girl” (a highlight from their recent album Love You to Death) was on display. 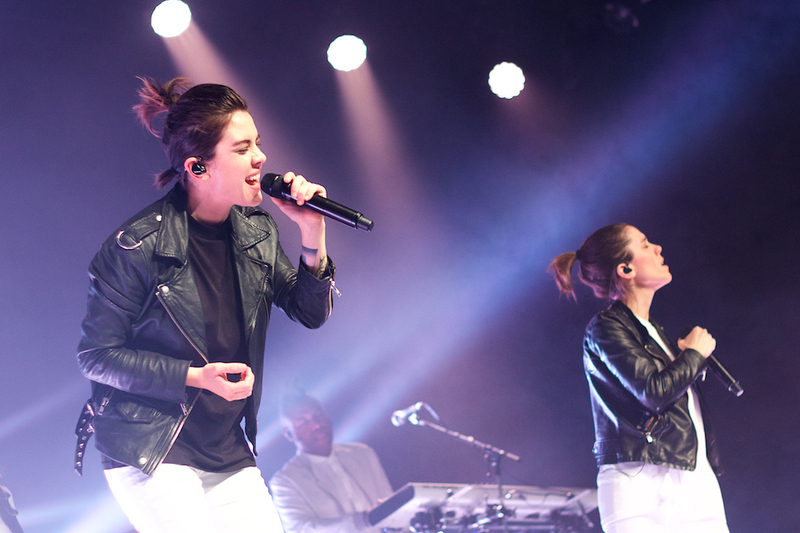 Along with their top-shelf backing band, Tegan and Sara played the hell out of each song, down to every flawless, intricate harmony. During the set, the twins demonstrated that, while they may be identical, their personalities aren’t. Tegan proved more comfortable in the spotlight, quipping between songs and lauding her #doublepony hairdo. Sara, on the other hand, was a bit more withdrawn, injecting her vocals with a heartbreaking yearning that contrasted nicely with Tegan’s commanding presence. Sara did berate one attendee for texting during the show, only to hilariously backpedal once he revealed he was arranging a ride home. Considering that Tegan and Sara made it up to the lucky concertgoer by taking a selfie with his phone, it’s doubtful that he minded too much.